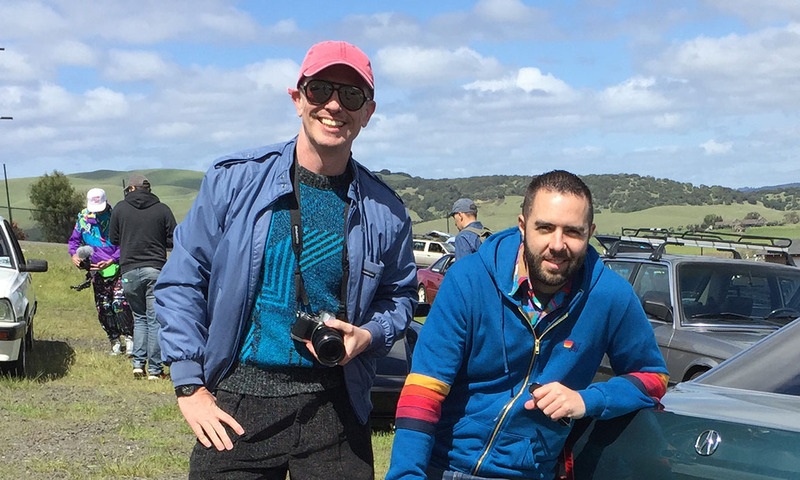 I got another dose of the magnificent 1980s and 1990s this past weekend on my trip to a car show that suits precisely those model years. This was thus the third time I’ve driven between Phoenix and the San Francisco Bay Area in 3 weeks. 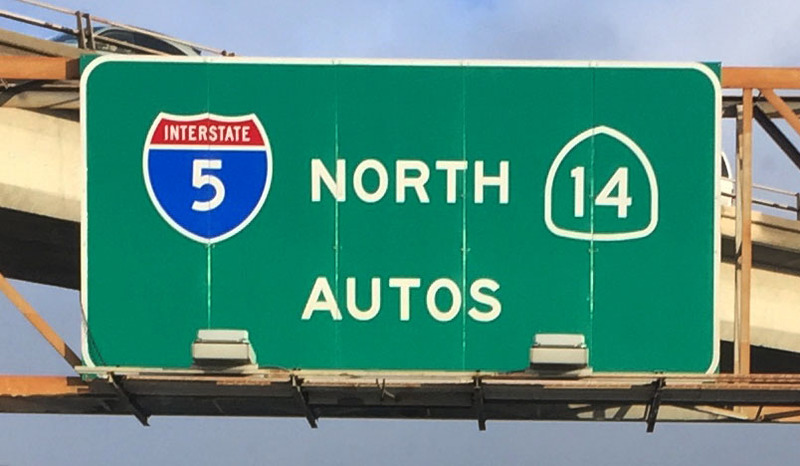 I’m getting to know that Interstate 5 corridor like the back of my hand! 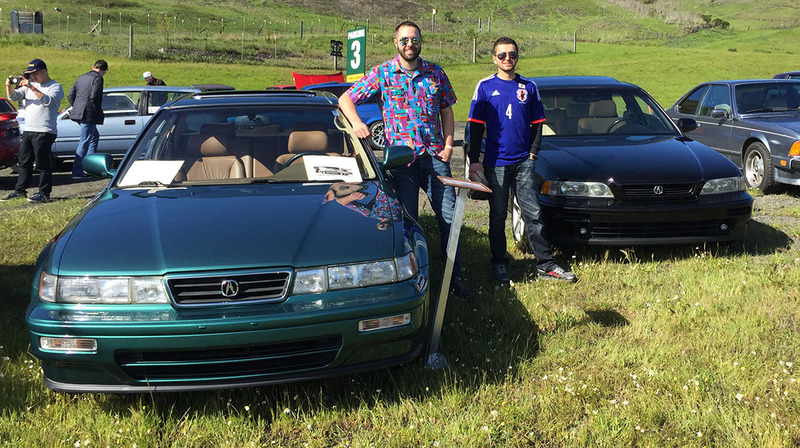 This time, the purpose of the trip was not to buy or transport a purchased car, but rather to meet up with some friends at a celebration of all things “rad,” at Radwood 2018. Sonoma Raceway has been around for 50 years and is nestled in the southern Sonoma Mountains at a landform called Sears Point. It has a 2.5 mile long course and capacity for 47,000 spectators. This weekend, the facility played host to a wide array of cars from the decades of yesteryear – complete with the wardrobe and music that go along with that era. Here’s a link to my post about the prior Radwood show, held in Anaheim last December. This marked the longest trip I’ve taken in my Vigor in the nearly three years I’ve owned it, save the initial drive home to Phoenix from Denver when I bought it in July 2015. I’m happy to report that the car did remarkably well. I departed Phoenix on Thursday afternoon and had rainy weather throughout the westward trek to the Los Angeles area. 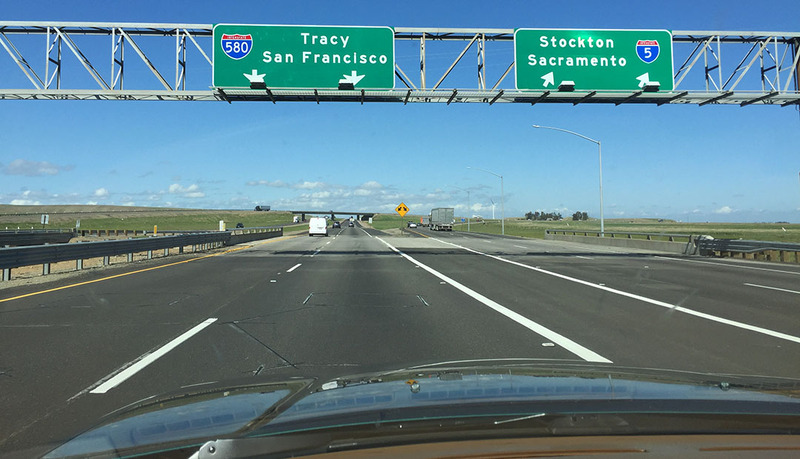 Then I headed north on Interstate 5 to the 580, the 680, the 780, and on to my final destination for the evening in Vallejo, only about 15 miles east of the Sonoma racetrack. 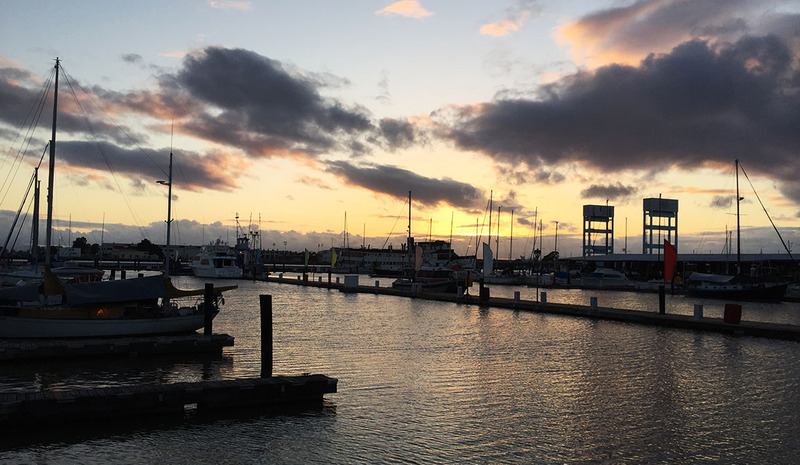 My drive took me across the Benicia – Martinez toll bridge across the Carquinez Strait. There are a lot of waterways in the area — something I’m not very accustomed to since I live in the desert. 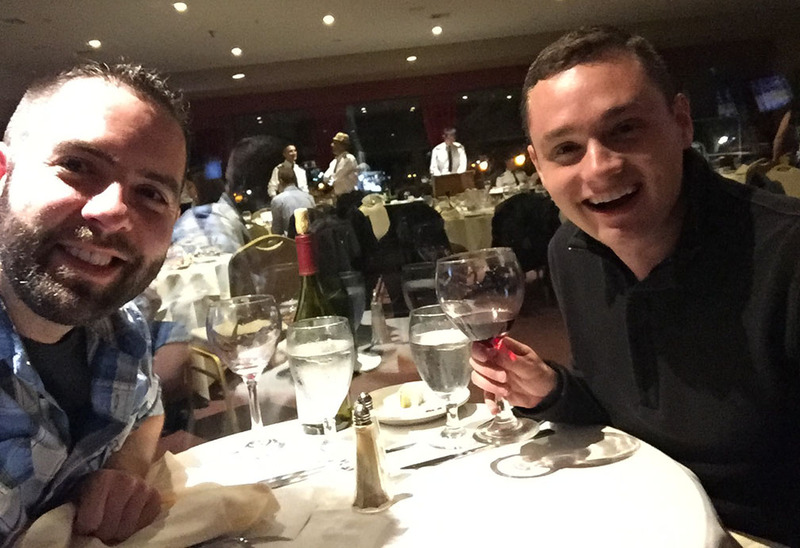 In Vallejo, I met up with my friend Jay who’d flown in from San Diego for the occasion. 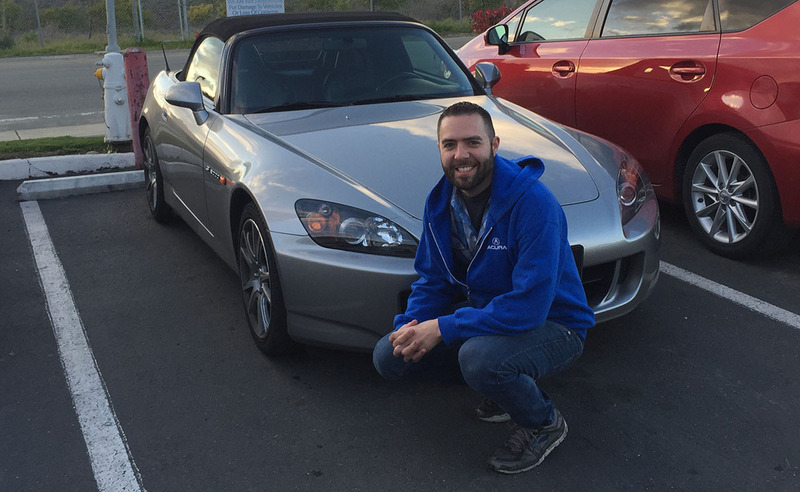 He rented a 2005 Honda S2000 on Turo which we took to dinner along the waterfront at an Italian restaurant. I did a quick parking-lot wipe-down of the Vigor before bed and it ended up getting rained on again overnight anyway. Saturday morning, Jay brought over some thrift store apparel finds: A vivid multi-color Wrangler button-down and a “California Lovin” blue hoodie. 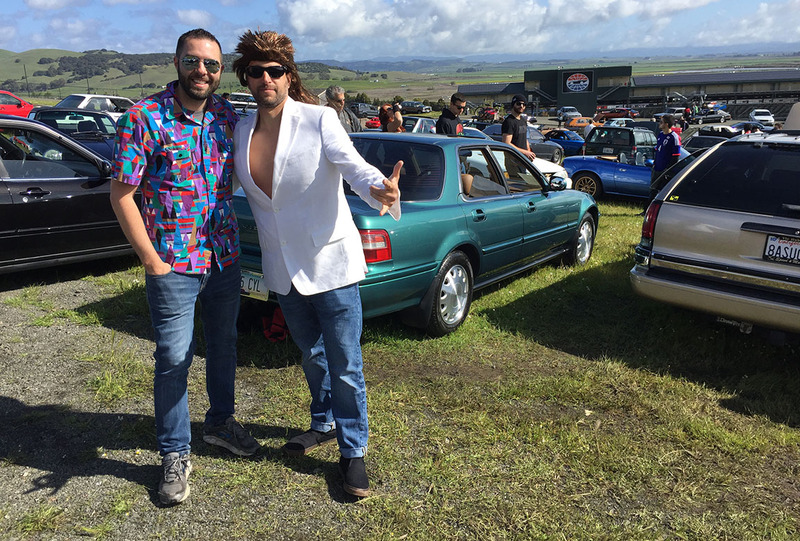 If you’re going to attend a vintage car show, you have to look the part. He also loaned me some pretty tubular Ray Ban sunglasses. My friend Jason took his wardrobe to a whole new level, complete with a copper wig. 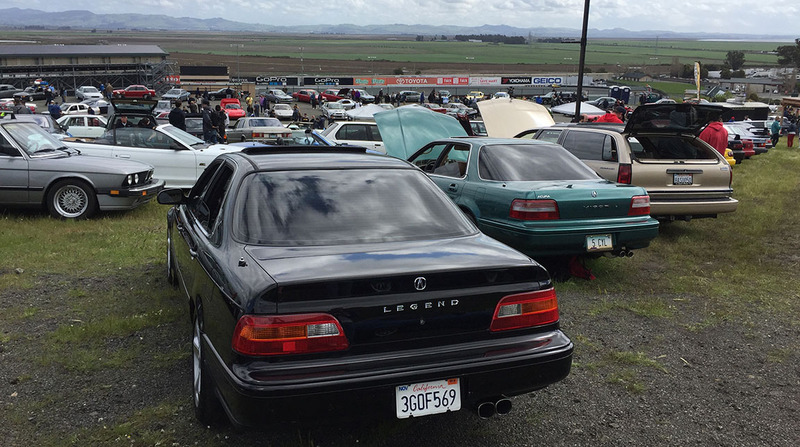 We timed our arrival at Sonoma just right in order to roll in with my friend Chris from San Francisco who brought his black 1994 Legend GS 6-speed. 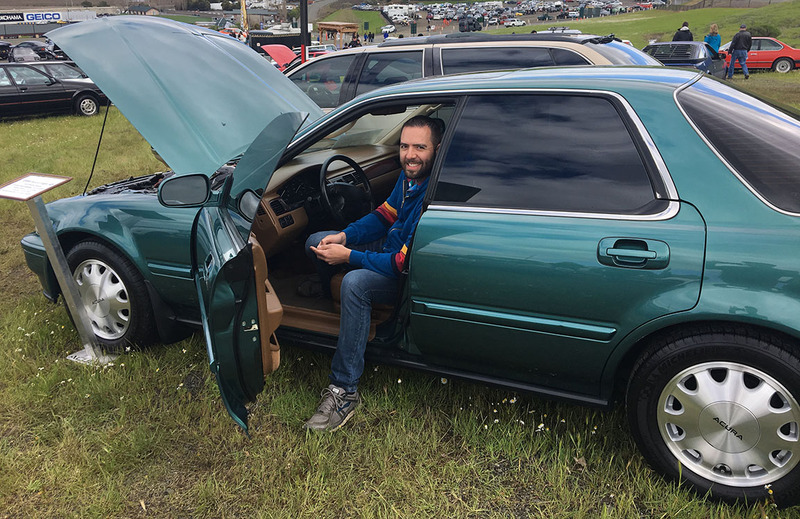 The car show was broken up into a few different parking areas, with “Radwood Royalty” being a paved lot and everyone else staged on a grassy hill next to it. Things were a little muddy thanks to the prior night’s rain but luckily the clouds held out and things stayed dry all day. The wind, however, got chilly and I was extremely grateful to Jay for giving me that hoodie. As was to be expected, there was a very vast array of automobiles from two to three decades ago. 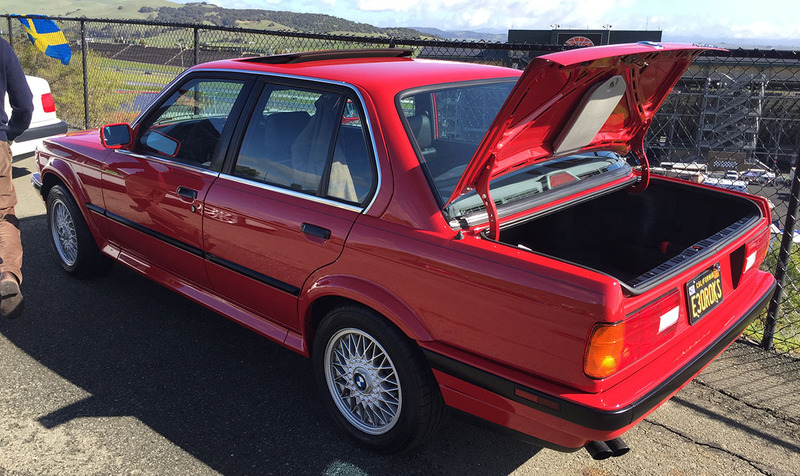 I would say the German brands dominated the field, with a lot of very clean “E30” 3-series BMWs including my friend Aaron’s exceedingly rare “IX” all-wheel-drive model. I saw a car called a Bitter for the first time, and I kind of chuckled that it had the same interior color as my Vigor – and even called it the same thing (“Cognac”). 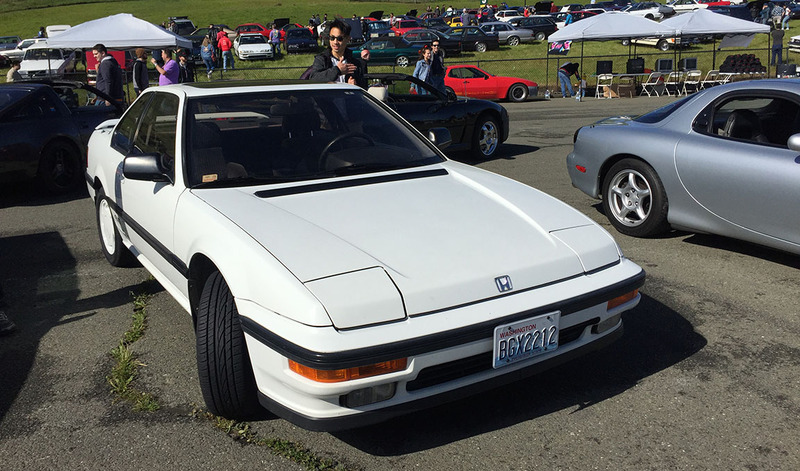 My preferred picks of course were some of the Honda products, including two very clean third-generation Preludes (this one showing off its four-wheel-steering feature). It was great to reconnect with friends again and catch up over taco truck food and classic music. There were a lot of accolades for the Vigor and its quirky powertrain combination. I made sure to display the window sticker and sales brochure, and I popped the hood to showcase that 176-horsepower, 5-cylinder powerplant proudly. 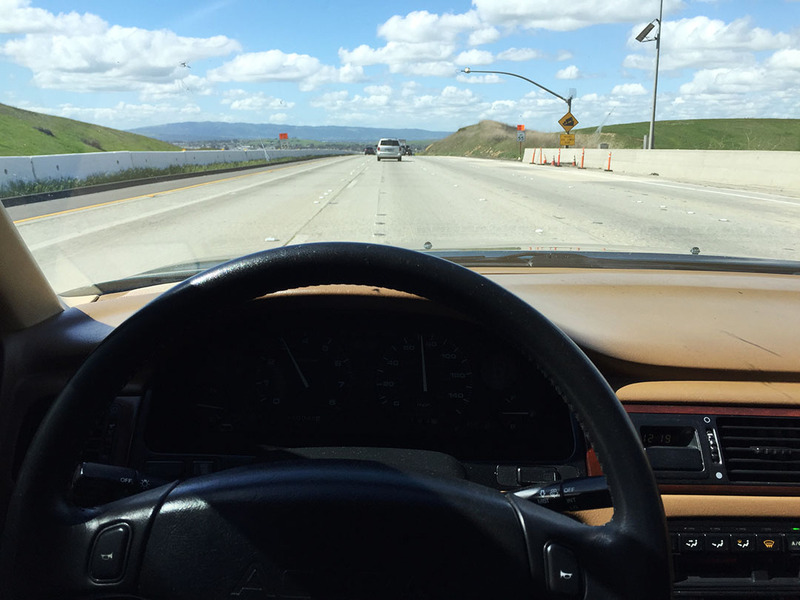 Coming locally from the SF Bay area was my buddy Shervin, in his 1984 Mercedes-Benz 300SD. 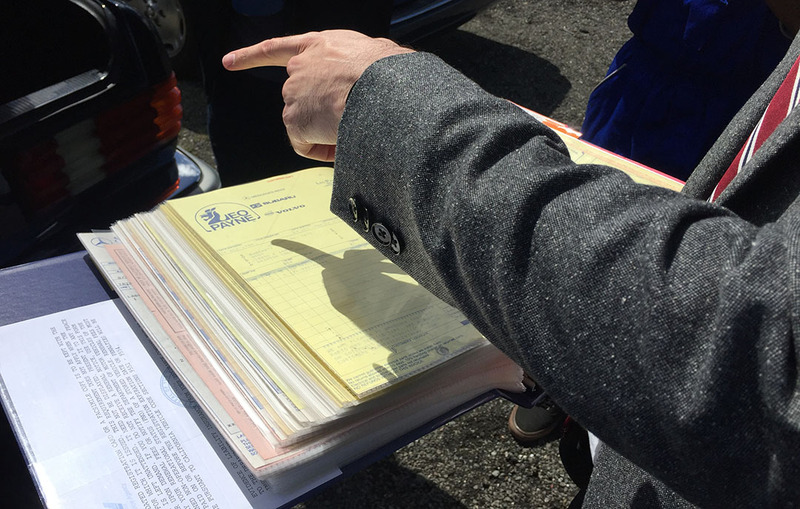 It had 205,000 miles on the odometer and a massive binder full of receipts. Shervin dressed the part of a successful 1980s professional in a business suit, and he accessorized his car with some period-correct items like cassette tapes and some Avery business card templates. He sure knows how to show up to a board meeting in style. Radwood was the only car show I’ve ever attended that had giveaways allocated by way of thumb wars and rock-paper-scissors. The “Best Japanese” award ended up going to a very clean Nissan Pulsar Sportbak. I sadly gave back the borrowed Ray Bans and hit the highway southbound, going as far as Buttonwillow, California that evening (only about 4 hours away). The Vigor proved itself as a pretty good road tripper with comfortable revs and a surprisingly quiet cabin considering it has frameless door windows. I checked in at the Motel 6 around 9:00 p.m. – my third night in my third M6 of the trip. If there were such a thing as a Diamond Platinum Preferred Motel 6 member, I’d be top dawg. 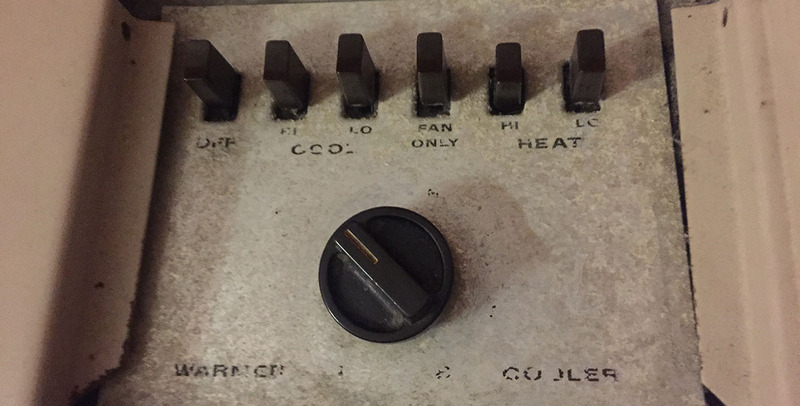 But when’s the last time you saw a window-mounted climate control unit that looked like this? I guess the motel was last remodeled about when Radwood-era cars were new. The final stretch to Phoenix was on Sunday, with just one more stop in Palm Desert for a bean & cheese burrito and an energy drink to fuel me up. It was a whirlwind trip, but what Drive to Five adventure isn’t? Thanks for coming along and enjoying some of the great 80s and 90s with me! 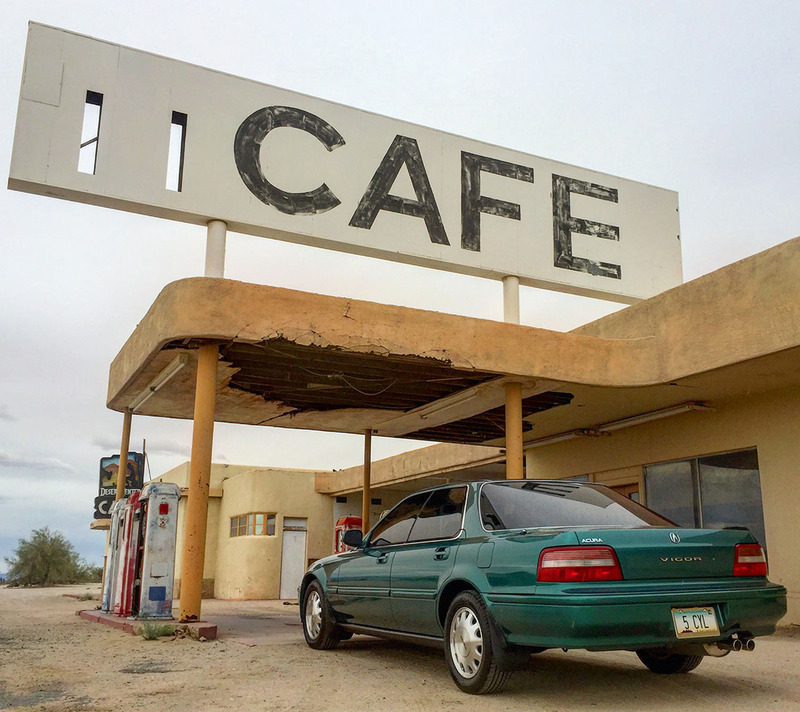 Traditional stop in Desert Center. I go there with all my cars! 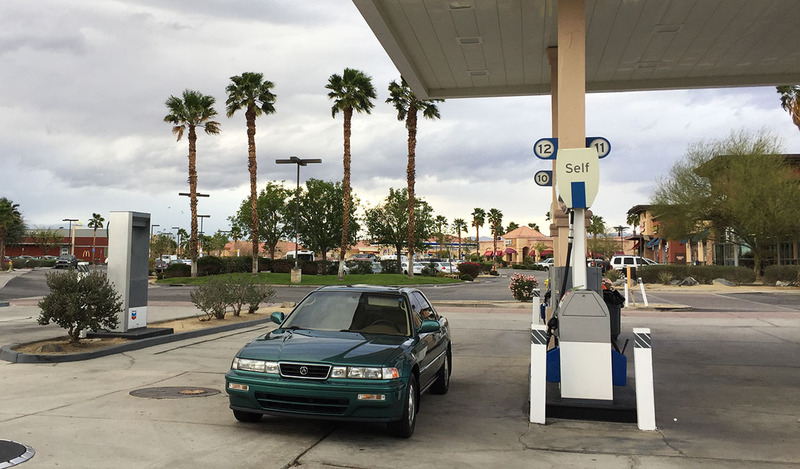 Fueling up in Palm Desert at Chevron. Taco Bell for lunch in Buttonwillow. Does it look familiar? It should. 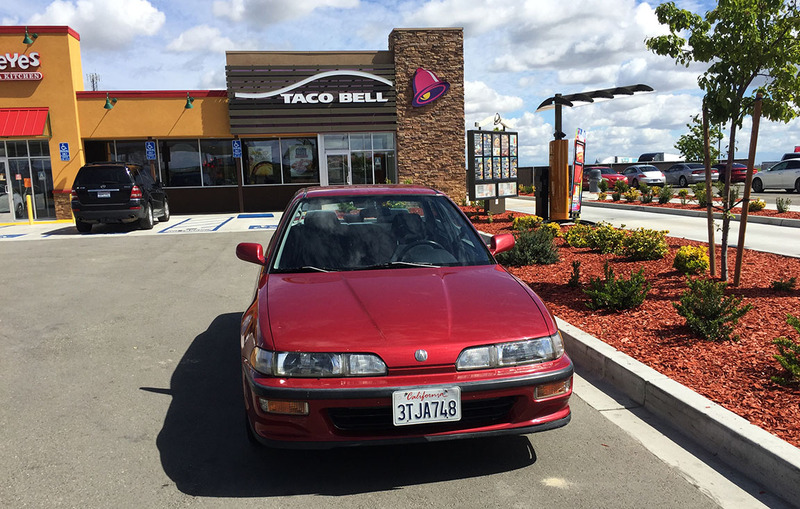 Because I was just there with the Integra sedan six days prior. Northbound on Interstate 5 at the split with I-580. I took this same route last year when I went to Sacramento for NALM 2017. Westbound on I-580 toward Dublin. 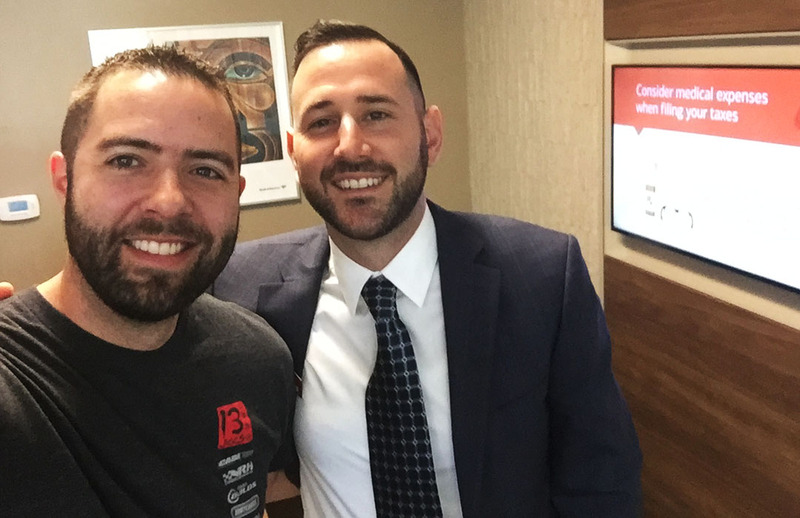 Met up with my friend Brian at his office. Jay’s rental S2000 that we took to dinner. It was a fun little ride for 13 years and 133,000 miles old! Having some fettuccine alfredo with Jay. Arrival at Sonoma with Chris and his friend Alfred in my sideview mirror. Pretty good shine on these old rides. 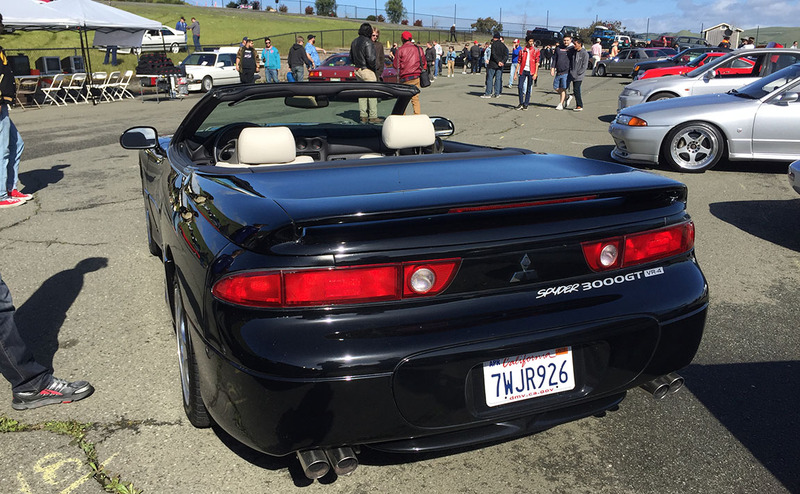 Remember the Mitsubishi 3000 GT Spyder? And better yet, remember the 1980s Chevy Nova? Someone actually restored one of these and I love it! My friend Chris who flew up from LA for the occasion. Driving home through some misty fog on I-5 southbound. 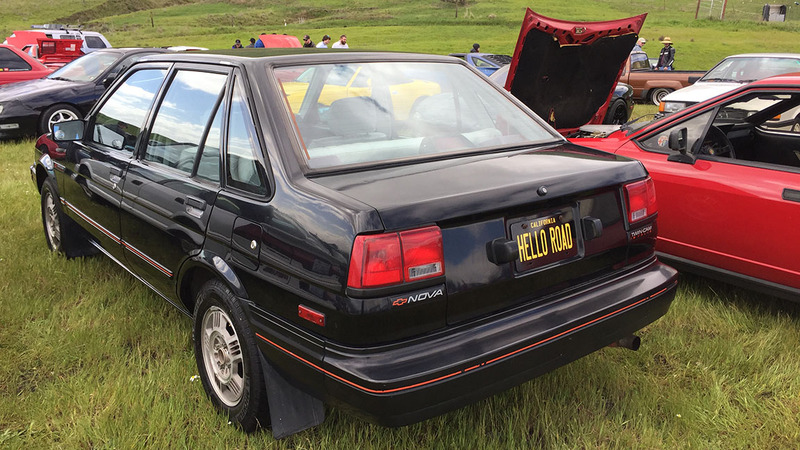 This entry was posted on March 26, 2018 at 3:13 pm and is filed under California, Car Show, Legend, Road Trip, Vigor. You can follow any responses to this entry through the RSS 2.0 feed. You can leave a response, or trackback from your own site. Nice recap of a fun trip! 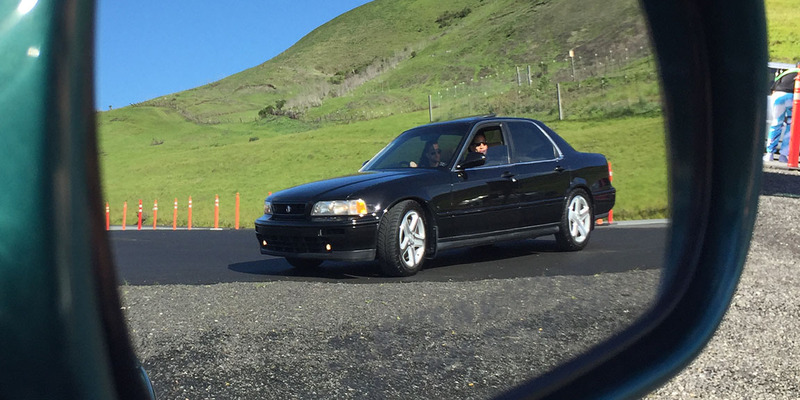 Did you get to take the Vigor around the track at Sonoma? I was curious about how that went since I had to take off. Thanks Chris! After you departed, the awards ceremony only lasted a few more minutes. However, we were told the checkered flag for the race underway wasn’t going to happen until 4:30 p.m., nearly an hour later. Jay and I were a little chilly and I was anxious to start knocking out some miles on my drive home, so we took off around that time. I later heard that the parade lap was pretty fun, though. Aaron did it in his 325ix. Got it. I don’t blame you. I would have enjoyed doing that — I’ve never driven my car (even slowly) on such a track. Maybe in the future! I love the white 4WS Prelude, also the 6 series BMW that was next to the Legend. I remember when that Legend was for sale but the interior was the wrong color for me. Cool to see all the cars get their few days of fame every now and then; and memories to go along with it. I ha e find memories of day tripping that car back in 2016. Totally. You will create a lot of memories in your GS this summer on your way to/from Colorado with the family. That’s what it’s all about. Thanks for getting up to speed with the blog and videos and for being part of the adventures on frequent occasions. Someday I wouldn’t mind having another 4WS. Barbados yellow this time. Vigor has such great wheels. Those are the stock wheels right? It does! They are stock 15″ wheels. I had them refinished shortly after buying the car in 2015, by a company locally called Alloy Wheel Repair Specialists (AWRS). The finish has held up remarkably well! I’m very happy with them. Thanks Carlos. So just curious about the monotony of the drive and how u listen to tunes during the drive since none of ur cars have an Aux jack and/or Bluetooth? In this case I ended up using a cassette tape adapter and an old 80-gig iPod “Classic” that has over 15,000 songs on it. The sound quality isn’t very good at all but it breaks up the monotony. It only seems like you were at the last Radwood show a week or so ago, time flies! I can’t say I have ever heard of the Nissan Pulsar Sportbak – so I’ve had to do a Google search. We’ve got a few coupes, which are called the Nissan EXA here in New Zealand. I’ve never seen one with a sportbak rear canopy, that’s ultra cool. Kind of reminds me of the Honda Aerodeck, which I’m still actively on the hunt for. 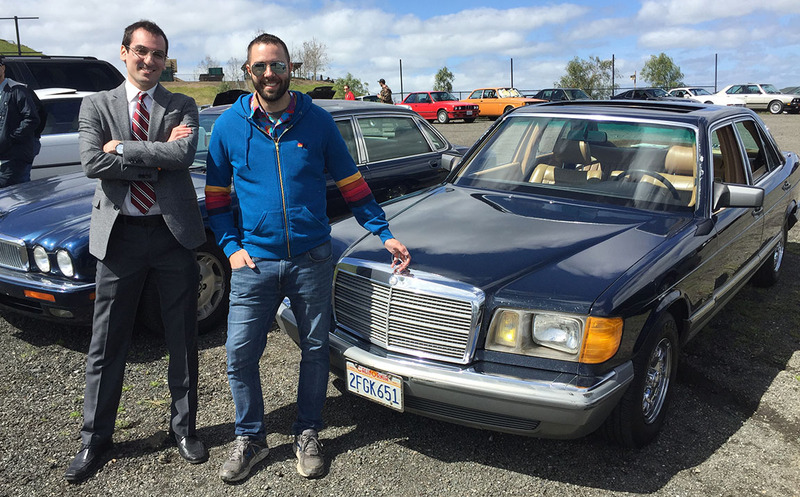 Loving Shervin’s 300SD Merc, there’s nothing quite like the build quality of an 80s Merc and it brings back memories of when I had my ’88 S-Class. Anything planned for the Easter weekend? Yes I thought of the Aerodeck too! One of these days you should fly out here for a show like this. It would be interesting to talk with you and learn about the differences between US market cars vs. the vehicles in your area. Funny you ask about Easter weekend – I was just ironing out plans for that. Looks like it will be a Legend coupe weekend, going to southern Utah to spend a couple of days with my family. How about you? Yep, I totally should! I have plans for an event called “Warbirds over Wanaka”, that have the biggest Packard car display I think we’ll ever see over here. Then, back in town, we have the Jaguar Nationals on – so I’d like to attend the show and shine for them. Hope you enjoy your weekend away in the coupe with your family. I HAVE to make it to one of these shows! Let’s talk whenever the next one is that you plan on attending. Amazing to see so many clean examples of neat cars, including that Nova. I don’t have much love for GM, but the story behind NUMMI is pretty cool, and that Nova is one of the first cars to come out of the venture. “New United Motor Manufacturing Incorporated” from 1984 through 2010. And today the facility is owned by Tesla! I love these little nuggets of information I learn every day despite being a car nut my entire life. Thanks for that. By the way, I did see somewhere that there will be a Radwood again in northern CA sometime in June – but I’m booked that month & can’t make it. I’ll hold off and attend the LA area event slated for December, like last year. Maybe you can swing out here for that. Awesome trip, Tyson! Loved seeing all those cars from my childhood. The Vigor looks great as always, and I really enjoyed the Prelude, too. As for the Nova, wasn’t that a car that Chevy made in collaboration within Toyota or something? It vaguely rings a bell. The waterfront photo was fantastic, by the way. The guy with the Nova is Ethan from Hello Road (https://www.youtube.com/channel/UCASdNl0eESlmjmCVJ2U0D7A). He’s got a Radwood video up on his channel too! Thanks @coderaaron for that tip! Turns out, I was already subscribed to Ethan’s channel. Loved his RW video! Nothing but good stuff here. That Legend sedan with the piano black trim is gorgeous! 99-02ish TL-S rims? This must be a record for how many times you’ve been to Cali in one month! I know – thinking I’ll take a break from any CA jaunts for at least the next few weeks. 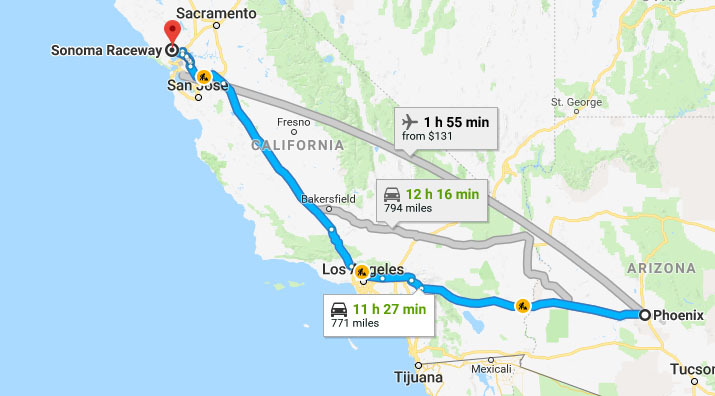 Next trip out that way might be in mid-July to San Diego. The wheels on Chris’ Legend GS are the 17-inchers from the 2001-02 CL Type-S. They have a lot in common with the TL-S wheels but only when you get them side by side can you tell the difference. TL-S wheels have a little lip on them, CL-S have skinner spokes and no lip. But darn close! Good eye! I remember the Bitter SC in the mid 80’s. Beautiful car, but way overpriced at 50k compared to the coupes in that class. From someone who learned to drive with a ’80 Buick Century Wagon, I LOVE the Roadmaster Wagon next to you. So apparently the son of “The” Mr. Bitter was in attendance at the show, and he’s the one who brought that SC. Interesting! A star in our midst. Any pics of that 1980 Century? The guys in the Roadmaster were having quite the tailgate party. Awesome car. Hello Tyson. I thought of you and Arizona when I saw this video. Thanks for sharing that, it was a very emotional event for that trooper. We do have some great law enforcement personnel here.